I’m finally doing it. I’m holding a solo photography exhibition. I’ve displayed work over the Big Sound conference before, but this time, Big Sound have invited me to exhibit exclusively as part of the conference. I was really nervous but honoured. Note: You don’t need to be a Big Sound delegate to enter Crowbar at any of the times listed on the flier above. I’ve been photographing legendary bands in intimate venues for a few years now. I’ve seen lineups of people stretch around block hours before doors even open to try get a chance to see their favourite band up close in a small room. I’ve seen surprise shows go down with less than 30 minutes notice with only two hours of planning. I’ve captured musicians at their most energetic and most depleted after giving their all to 300 of their biggest fans. No Pits, Just Pits is a collection of photos of some of Australia’s biggest bands playing some of Australia’s most intimate venues. So why the name, No Pits, Just Pits? The beauty of capturing live music photos at smaller venues is that there are no photography pits. This makes it pretty rough while trying to take photos in the mosh pit without a guard rail to protect you. But everything I’ve photographed without a photography pit to protect me from the moshpit has felt rewarding. Every night it’s the same. No photography pit, just a violent mosh pits of dedicated, happy fans and one super happy photographer. 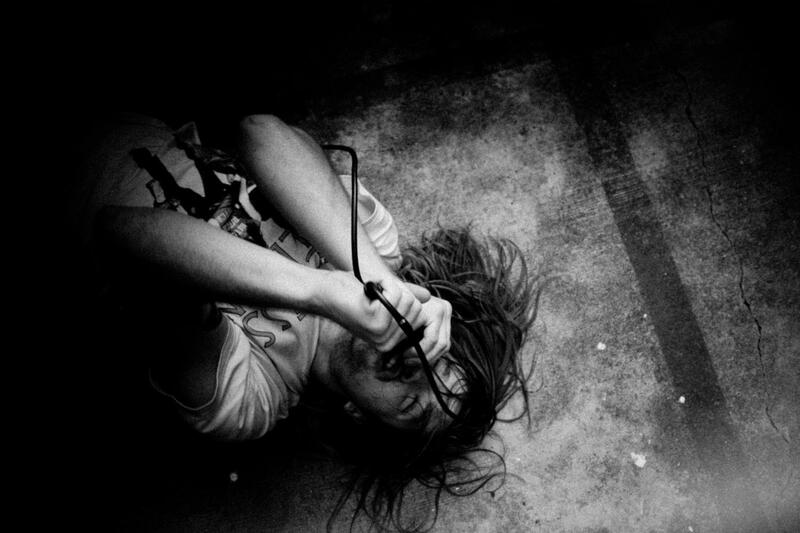 By documenting the tireless efforts of musicians in venues both large and small, Matt Walter has emerged as one of Australia’s most sought-after music photographers. Published by TIME, VICE Magazine, Huffington Post and more, Walter’s diversity has earned him an impressive client list. Walter is trusted with the tour photography for Violent Soho, The Smith Street Band, Dune Rats, Ceres, The Bennies and more. Whether he’s riding high on Damian Abraham of Fucked Up’s shoulders or laying down in a surging circle pit during a Violent Soho show, Walter’s commitment to capturing the raw energy of a show is second-to-none. On Wednesday 6 September from 6pm – 10pm, Church is hosting an opening night event for the No Pits, Just Pits exhibition! I’ll be at Church all night chatting and drinking a beer or two with anyone kind enough to come check the exhibit out. I will be telling people the background stories of photos, answering questions about what it’s like to be a music photographer, and all the times I injured myself in a violent moshpit. This exhibition is one of your only chances to buy some of the photos that are exhibited. There’s multiple sizes and quantities available, but no reprints or backorders are available. You can buy them unframed or order one framed with one of Big River Picture Framing’s most excellent frames. Church accepts credit card or cash for prints. Final quantities and sizes are to be determined, but get in early to avoid disappointment. The Crowbar family are being gracious enough to allow me to be the first artist to exhibit in their new dedicated art space, called Church. 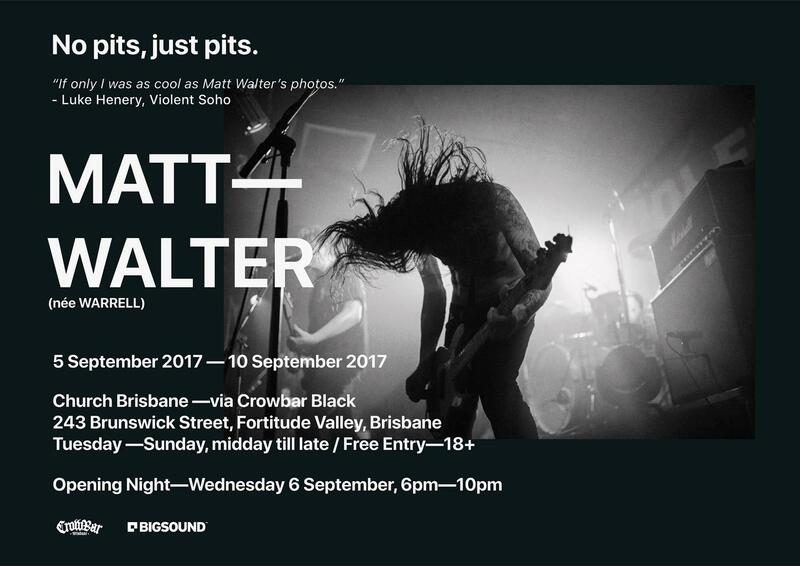 It’s the perfect venue for the exhibition because it’s where my music photography journey started thanks to one of Crowbar’s owners opening the venue up to me – Trad Nathan. Church is curated by Megan Starr-Thomas. Thank you, Trad, Tyla and Megsy! My friends really came together to help me with this. Danny Beus of Dune Rats, Luke Henery of Violent Soho, Jake Laderman of Clowns and Karina Utomo of High Tension all shared such nice words about my photography for the exhibition posters. and the legend Tom Lanyon of Ceres designed up the poster for me. So while it’s my first solo exhibition, I still see it as a collaboration because I feel so supported and helped by so many legends. So come down and share this special event with me and my friends and let’s grab a beer together!